Our mission is simple, to be number one at what we do. Rock Me Apparel is a company that has the mental attitude of working together. We believe in synergism, the potential ability of individual organizations or groups to be more successful or productive as a result of a merger. Whether through domestic programs or imported goods, we can work with you to make sure that your garment will be produced perfectly. We are an approved manufacturer for retailers such as Walmart, NBCC, BBC Worldwide Limited, Creative Action Network, Dreamworks Property, Happy Wheels, Saban Brands LLC, Marvel, Disney, Star Wars, Cartoon Networks, etc. We can guarantee a quick turnaround with high quality. 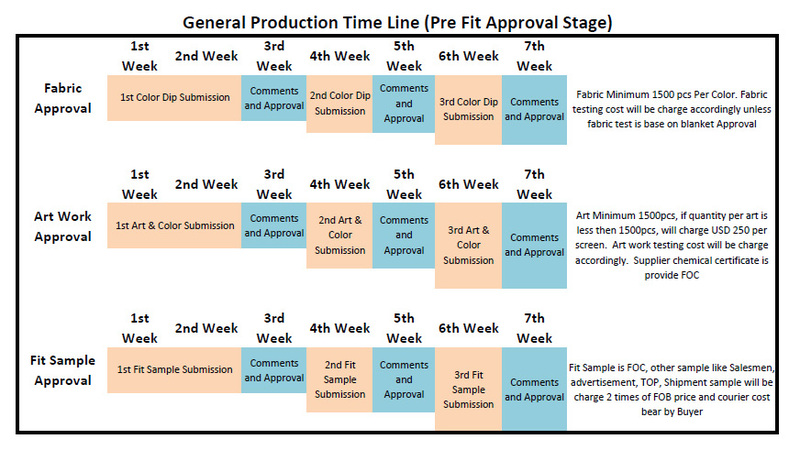 Below you will find our approximate production timeline; of course, depending on your need and budget, we can work with you to exceed your expectations. E-mail Quote Request Form to sales@rockmeapparel.com or contact us by using form below.